This installation will add a universal roof rack fairing to the factory roof rack on a Subaru Impreza wagon. 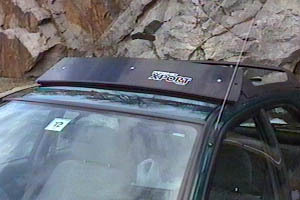 One of the annoying features of the roof rack is the loud whistling from the front bar during highway driving. This is an attempt at the cheapest way to add a fairing to the Impreza Outback Sport, while still maintaining a professional look. I happened to have the $19.99 Barrecrafters adaptors from a previous project to adapt a bike rack to the roof rack, as well as on a Barrecrafters ski rack that I've been quite happy with this winter. Performance Bike then had their fairing on sale at $20.99, a savings of $10. Sounded like a good candidate for this project! Locate the three U-brackets, 3 long carriage bolts, and matching washers and wing nuts. They are shown in the left side of this picture. Discard them. 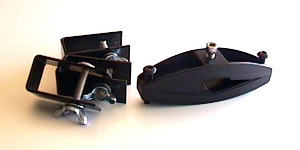 One of the Unisport adaptors is shown on the right side, with a 1/4"x20 bolt in place. The UM-100 kit comes with four; since only three will be used, one will be extra. Carefully assemble the supplied rubber strip or gasket to the bottom of the fairing, and then fasten the two outside struts to the fairing. 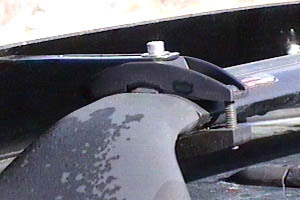 Since the outside struts will be stretched to their maximum lengths, the middle strut cannot be fastened to the middle of the fairing; simply use the short carriage bolt, washer and wing nut set to plug up the middle mounting hole, and the wing nut itself will be used as a spacer to prop up the fairing (see below). Before fitting the slotted bars or struts to the fairing, straighten them out slightly at the angle bend, as we will need every length of the strut to clear the side rails of the roof rack. 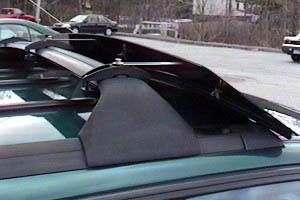 Attach three of the Unisport adaptors to the front roof rack bar. Line the two outside adaptors flush with the gap between the load bar and the plastic risers. Fasten the struts to the adaptors. The middle strut will "hang" in place, so that the middle wing nut will rest on top of it. 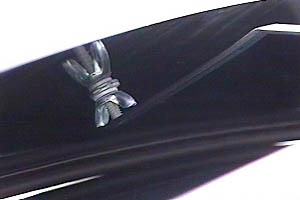 This will help maintain a slight curve to the fairing and keep it from moving under wind loads. Adjust the struts and adaptors as necessary to obtain a uniform and symmetrical fit. Tighten down all bolts. The fairing is 42" at its longest part at the bottom. The sides extend beyond the rain gutters slightly. Also, the fairing sits about 8" back from the top of the windshield. 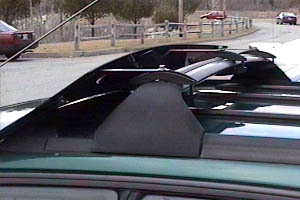 Although it doesn't look as macho as if it was lined up with the windshield, this configuration is probably more effective at eliminating the roof bar whistling noise.